USI president Annie Hoey. Photograph by John Kelly. Student leaders have called for a minimum €500 cut in the annual third-level contribution of €3,000. The Union of Students in Ireland (USI) says the upcoming Budget must include an investment of €140m for higher education, but that students should pay less. The USI is also seeking a reinstatement of grants for post-graduate students, as well as €5m in funding in mental health services for colleges. The calls are made in the USI pre-Budget submission being launched today, and hand-delivered to the constituency offices of Taoiseach Enda Kenny and Fianna Fáil leader Micheál Martin. 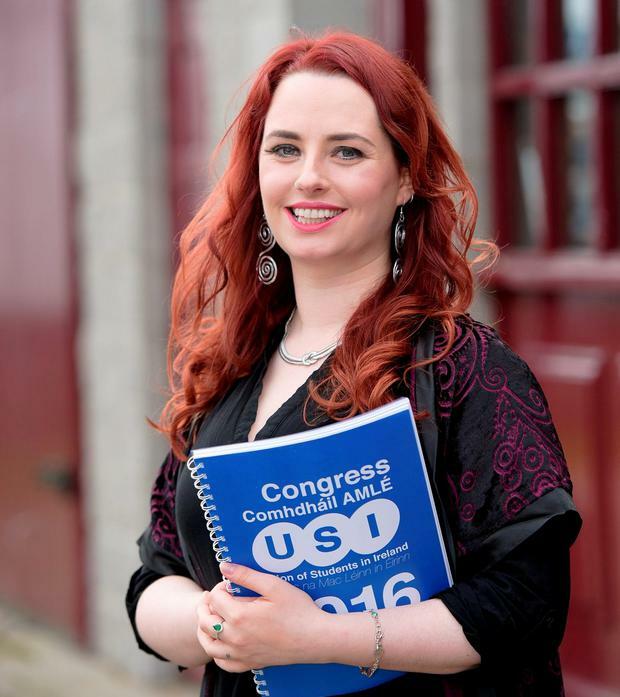 USI president Annie Hoey said students and their families were extremely concerned about the ever-rising cost of third-level education. According to USI, a reduction in the student contribution charge was absolutely vital to opening the opportunity of third-level education to those from lower socio-economic backgrounds, and to increase social mobility in Ireland, in line with the recovery. Ms Hoey said "dramatic increases in accommodation costs, a shortage in appropriate part-time work, and the burden of €3,000 fees contributed to a burdensome annual cost of around €11,000 to attend third level" for those living away from home. She said that USI research showed that 58pc of students used extreme budgeting tactics, such as missing meals, in order to meet the costs of education. And research into student dropout showed that financial issues were a significant trigger for withdrawal from third-level. Ms Hoey said that abolition of post-graduate grants, in 2012, had created a two-tier system, where students from lower socio-economic backgrounds could not progress beyond undergraduate level. Calling for a Budget commitment to invest €140m a year in higher education, Ms Hoey said that the sector should be praised for its efforts to deliver quality education during a sustained period of under investment and uncertainty. But she said that what was necessary in a time of crisis was not sustainable as a long-term model. "It's time to match talk of economic recovery with strategic investment in vital public services such as education," said the USI president.